Romain Grosjean has been given a one-race ban for causing the first-corner crash at the Belgian Grand Prix. The 26-year-old Frenchman, who has been involved in seven first-lap crashes in 12 races this season, was also fined 50,000 euros (£40,000). The Lotus driver moved rapidly across McLaren's Lewis Hamilton at the start of the Spa race, causing a collision. 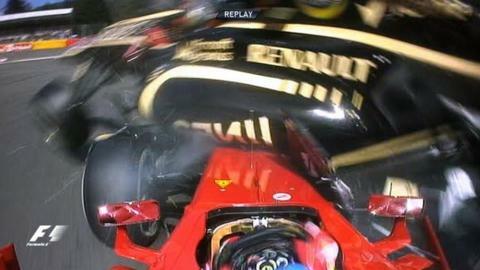 His out-of-control Lotus then hit Fernando Alonso's Ferrari, narrowly missing the Spaniard's head. The crash also took out Hamilton and Sauber's Sergio Perez. Kamui Kobayashi was affected in the other Sauber, eventually finishing 13th. "The stewards regard this incident as an extremely serious breach of the regulations, which had the potential to cause injury to others," read a statement from the FIA, the sport's governing body. Grosjean, who is the first driver to be banned from a race since Michael Schumacher in 1994, said: "I misjudged the gap to Lewis. I thought I was in front of him. It was a small mistake, but a big incident. "I'm very sorry and I'm just glad nobody is hurt. That's the main thing." Lotus team boss Eric Boullier added: "This is a severe penalty, but it's part of his learning curve. "Part of the problem is that he wants to do well. He is somebody who is a perfectionist. He needs to understand he will deliver more if he doesn't put too much pressure on himself at the start of the race." Hamilton refused to discuss the incident in detail. "I really don't want to talk about the start," said the Briton, world champion in 2008. "People can see what happened." I think we broke everything on top of the car, so it was lucky in that aspect. Hamilton said he had been involved in worse crashes, but Alonso, the world championship leader, said he was "lucky" not to have been injured in the pile-up. "You can have an injury in your hand or even in your head because everything was so close," said the Spaniard, who revealed the accident had left him with back pain. "I think we broke everything on top of the car, so it was lucky in that aspect. I did not know what happened until I saw the TV. It was difficult to imagine how the hit could be so big." Speaking before the punishment was handed out, F1 legend Niki Lauda felt Grosjean had caused a "stupid accident". The three-time world champion, who was watching from the pit lane, added: "If I had to make a decision, I would stop him for two races because this was the most dangerous act he ever did." David Coulthard, another former driver and now a co-commentator for the BBC, thought Grosjean was a "little too aggressive" into the first corner. "You have to respect your movement at the start of a grand prix," said the Scot. "You cannot swerve from the left side to the right side without any sort sense of where the other cars are." Alonso, a double world champion, refused to criticise Grosjean, who was his team-mate at Renault in the second half of 2009. "I am not angry," he said. "No-one does this on purpose. They were fighting, two aggressive drivers on the start - Lewis and Romain - and this time it was us in the wrong place and the wrong moment." However, he pointed out that Grosjean's record does not make good reading, saying: "It's true also that in 12 races, Romain had seven crashes at the start, so…"
Who last received a race ban? Michael Schumacher was the last driver to serve a ban. His was in 1994, when he missed the Italian and Portuguese Grands Prix for ignoring black flags at the British Grand Prix that year. Alonso also said it might be a good opportunity to review the performances of a number of drivers. Pastor Maldonado of Williams has also been a repeat visitor to the stewards after a string of incidents this season. "It's true we saw some repeat accidents, sometimes for the same people," said Alonso. "Maybe a different approach can be the solution. But it's not easy, all the incidents are different. "You need to take a different approach because Formula 1, with the speed, the time, the distance, it is difficult to combine all these three areas. Sometimes something that looks spectacular on TV is not so easy to avoid in reality." Alonso's retirement means Sebastian Vettel, second at Spa, has closed to within 24 points of the Ferrari driver in the championship. Alonso started the race with a 40-point lead.